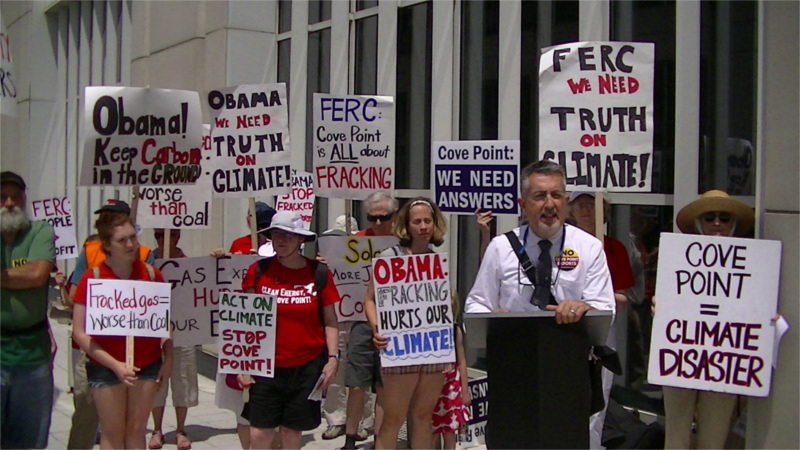 On the 23ed of June, Chesapeake Climate Action Network (CCAN) and residents of Calvert and St Mary's counties in MD showed up for the first of a week of lunchtime pickets outside FERC, the Federal Energy Regulatory Commission, otherwise known as the fracking industry's rubber stamp. 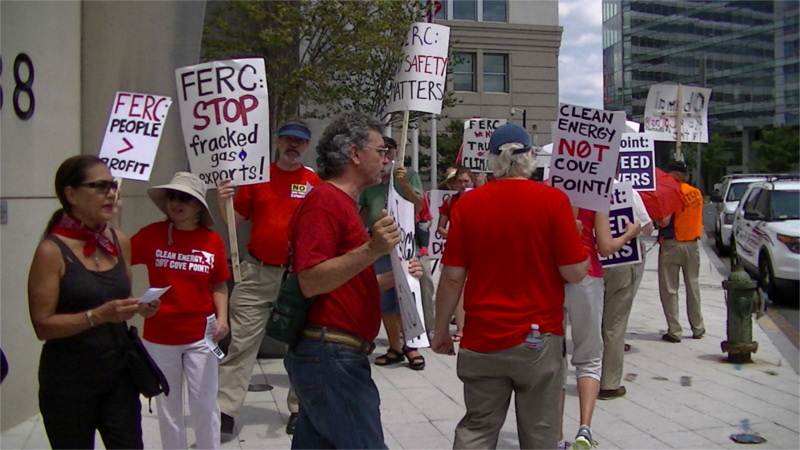 They are demanding that FERC reject Dominion Energy's plans to export fracked gas from Cove Point on the Chesapeake Bay. They warned that studies have proven that exporting fracked gas to Asia will cause more climate change than for Asian industries to burn locally-mined coal. They warned of the catastrophic accident risk of siting an LNG facility in a town of over 2,000 with only one road in or out. They warned that exporting gas and raising US energy prices will harm US manufacturing industry, thus costing jobs rather than creating them as Dominion is promising. A speaker from St Mary's county pointed out that Dominion's divide and conquer tactics of pitting labor against environmentalists has stirred up a wave of division in Calvert County, with neighbors now not even speaking to each other because of the gas issue. I have myself seen intimidation tactics laid on by Dominion's supporters, and the open arms with which some endangered Lusby and Cove Point residents have welcomed support in their difficult fight against regional bully Dominion Energy. One speaker said this was the first time picketers have ever shown up at FERC, but won't be the last. Pickets continue every day until Friday, June 27 from noon to about 1:30PM. Supporters are welcome to join in and much needed!